Chairman of the Presidential Committee on Northern Economic Cooperation will visit North Korea’s port city of Rason and attend a seminar hosted by Russia, Seoul’s Ministry of Unification said Wednesday. The Unification Ministry greenlighted an 11-member delegation, including the committee’s Chairman Song Young-gil, to visit North Korea on Friday and Saturday. The delegation will attend a South Korea, North Korea and Russia international seminar, organized by Russia, in Rason, which is home to a special economic zone established in the early 1990s. The invitation was extended by North Korea’s National Economic Cooperation Federation, according to the ministry. Song, who met with Russian President Vladimir Putin in Moscow in May, has been calling for a swift resumption of the cross-border logistics initiative the Rajin-Khasan Project, which connects Russia’s Khasan and the North’s Rajin port in Rason with South Korea’s port cities. He was visiting Moscow as President Moon Jae-in’s special envoy to Russia. Song’s visit to North Korea is viewed by experts as a meaningful step toward trilateral economic cooperation among the two Koreas and Russia, with a slew of projects that also includes a natural gas pipeline linking Russia’s Far East and the eastern coast of the Korean Peninsula now back on the table. “It seems the purpose of the trip is to inspect the key site of President Moon Jae-in administration’s ‘New Northern Policy’ and discuss trilateral economic cooperation through a seminar,” said Lim Eul-chul, a professor at Kyungnam University’s Far East Institute, alluding to the possibility they were gathering at the seminar to make the meeting seem “less official” under the current sanctions against North Korea. “The Rajin-Khasan project is not actually banned under the UN Security Council resolutions imposed on Pyongyang, so it can be pursued right away. Nevertheless, making economic investments in North Korea is banned and progress on US-North Korea talks on denuclearization has to be made in order to officially kick off the project -- (Song’s visit) is an opportunity to discuss relevant plans under such complex circumstances,” he added. Though Russia has long asked for the South’s participation in the project, heightened inter-Korean tensions over the North’s nuclear weapons program stood in the way. With the recent inter-Korean detente, observers expect discussions on the project to resume. Last month, Moon and Putin vowed to continue their economic cooperation, including in the energy and railways sectors. 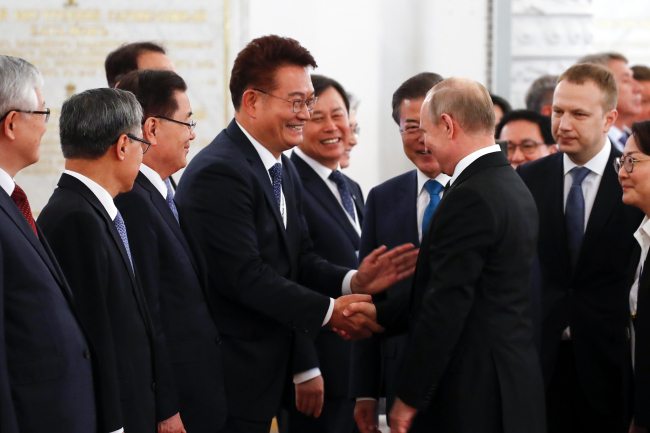 Moon promoted such ideas during his summit with Putin after outlining his vision to link the Trans-Siberian Railway to South Korea’s southern port city of Busan. The Presidential Committee on Northern Economic Cooperation denied that Song is to visit North Korea with such an agenda. “Rep. Song is visiting North Korea to attend a seminar and not as part of a government delegation,” Kim Tae-eun, a spokesperson for the committee, told The Korea Herald.